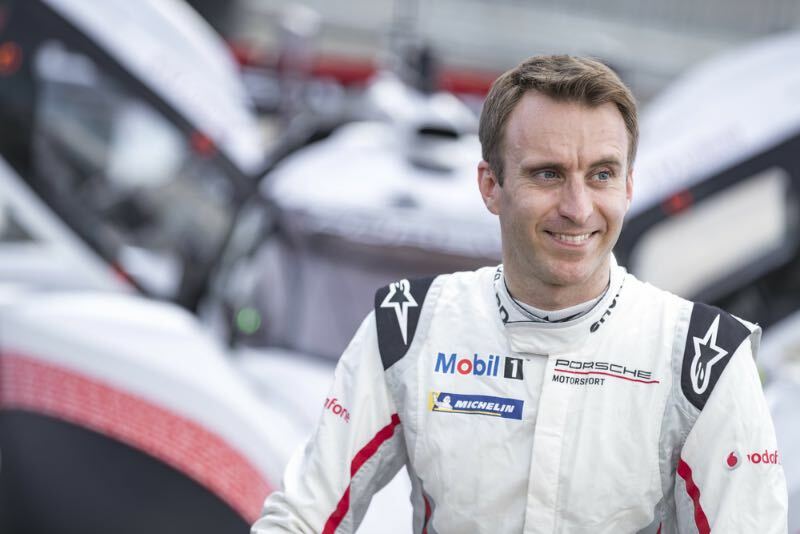 With 5 minutes and 19.55 seconds on the stopwatch Timo Bernhard crossed the finish line of the Nürburgring-Nordschleife at the wheel of the Porsche 919 Hybrid Evo. This results in an average speed of 233.8 km/h (145.3 mph) on what is revered by race drivers, engineers and enthusiasts alike as the world’s most difficult track. With this achievement, the two-times Le Mans winner and reigning World Endurance Champion has beaten the lap record on the revered 20.8 kilometre long German race circuit that stood for 35 years. On May 28 in 1983, Stefan Bellof lapped the world-renowned track with a Porsche 956 C in a legendary time of 6:11.13 minutes. For 35 years and 31 days Bellof’s 6:11.13 minutes record remained uncontested. The German driver from Gießen, who tragically died at Spa-Francorchamps in 1985, counted as the biggest racing talent of his time. He drove his record on May 28 in 1983 at the wheel of a powerful 620 bhp Rothmans Porsche 956 C during practice for the 1000-kilometre WEC sports car race. Also his average speed was over 200 km/h. Proud and relieved Timo Bernhard, five-time overall winner of the Nürburgring 24-hours clambered out of the tight Le Mans prototype cockpit. “This is a great moment for me and for the entire team – the 919 programme’s icing on the cake. The Evo was perfectly prepared and I have done my best on this lap. Thanks to the aerodynamic downforce, at sections I never imagined you can stay on full throttle. I’m pretty familiar with the Nordschleife. But today I got to learn it in a new way”, said the 37-year old from Bruchmühlbach-Miesau in the German region of Saarpfalz. 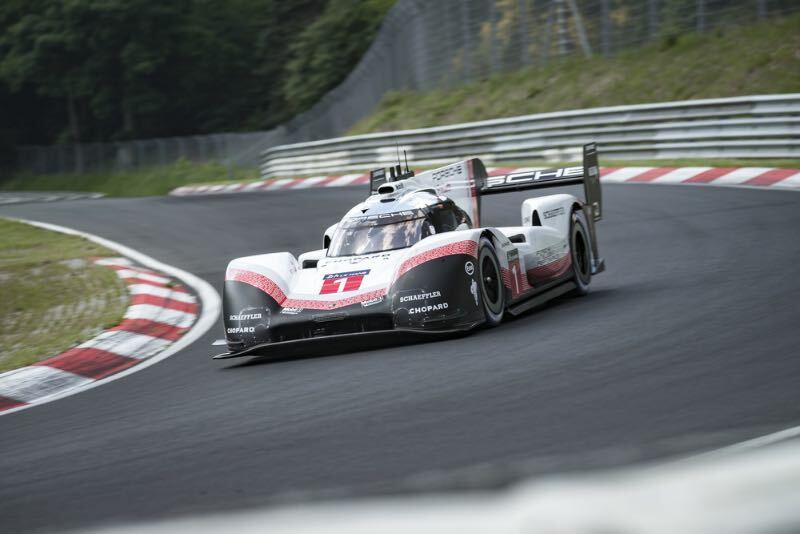 The success is the second track record on the Porsche 919 Hybrid Evo tally: On April 9 this year in Spa, the dramatic evolution of the three-times Le Mans winner lapped faster than a Formula One car with Neel Jani at the wheel. 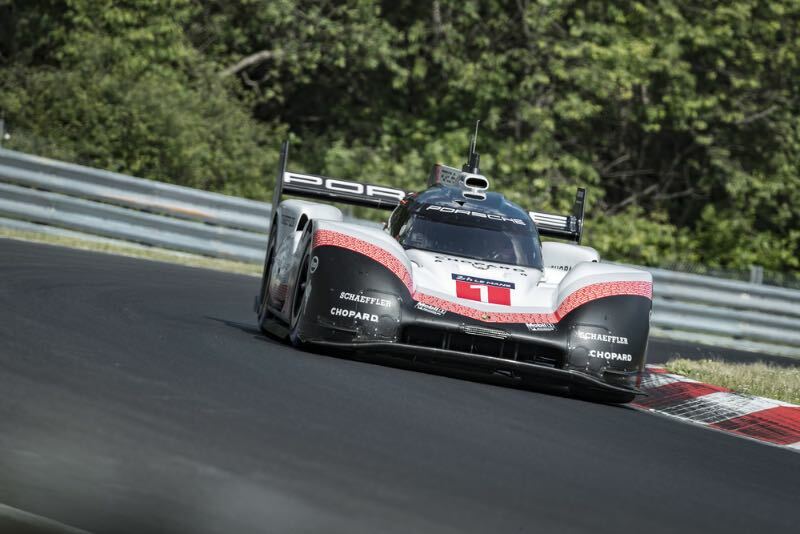 The 34-year old Porsche works driver from Switzerland – Le Mans outright winner and Endurance World Champion of 2016 – set a lap of 1:41.770 minutes on the 7.004 kilometre (4.35 mile) Grand Prix circuit in the Belgian Ardennes mountains. He topped the previous track record, set by Lewis Hamilton in 2017 qualifying, by 0.783 seconds. The British Mercedes driver took pole position for the Belgian Grand Prix in 1:42.553 minutes. The technical regulations from the FIA for the WEC and Le Mans, introduced in 2014, successfully delivered close competition between the conceptually very different class 1 Le Mans hybrid prototypes entered by Audi, Porsche and Toyota. To prepare the 919 Evo record car, the base was the 2017 world championship car. On top came developments that were prepared for the 2018 WEC but never raced after the withdrawal at the end of 2017. Additionally, several aerodynamic modifications were made. For the Porsche 919 Hybrid Evo the entire hardware of the power train remained untouched. The 919 is powered by a compact two-litre turbo charged V4-cylinder engine and two energy recovery systems – brake energy from the front axle combined with exhaust energy. The combustion engine drives the rear axle while the electro motor boosts the front axle to accelerate the car with four-wheel drive. At the same time it recuperates energy from the exhaust system that otherwise would pass unused in to the atmosphere. The electrical energy that comes from the front brakes and the exhaust system is temporarily stored in a liquid-cooled lithium ion battery. The WEC efficiency regulations limited the energy from fuel per lap by using a fuel flow meter. The V4 combustion engine’s output back then was around 500 hp. Freed from these restrictions, equipped with an updated software but running the regular race fuel (E20, containing 20 per cent bio ethanol), the Evo version delivers 720 hp. Because the amount of energy from the two recovery systems that could be used was limited as well in terms of electric megajoule per lap, the systems stayed far below their potential. With now full boost being available, the e-machine output increased by ten per cent from 400 to 440 hp. The engineers also unchained the aerodynamics of the 919 Evo from the regulations. The new larger front diffuser now balances the new and very large rear wing, both of which have actively controlled drag reduction systems (DRS). The hydraulically operated systems trim the trailing edge of the front diffuser and opens up the slot between the rear wing main plane and the flap respectively in order to reduce drag. Underneath the Evo the turning vanes and floor have been optimised. Fixed height side skirts increase the aerodynamic performance again as efficiently as possible. In total the aero modifications resulted in 53 per cent higher downforce and an increase in efficiency by 66 per cent (compared to the 2017 Spa WEC qualifying). To help further expand the performance envelope, the Evo gained a four-wheel brake-by-wire system to provide additional dynamic yaw control. Furthermore, the power steering was adapted for the higher loads and stronger suspension wishbones (front and rear) were designed. Compared to the car in conventional race trim, the dry weight was reduced by 39 kilograms to 849 kilograms. To achieve this, air-conditioning, windscreen wiper, several sensors, electronic devices from race control, lights systems and the pneumatic jack system were removed. Michelin developed special tyre compounds for the 919 Evo that produces more downforce than a Formula One car.